This tree in my neighbours garden is about 9 foot tall. The panticles looks spectacular in the evening sunlight but overall the plant is prone to suckers and consumes a lot of space. If you get sucker problems try cut out at the root. They can become invasive. Autumn leaf colouring of yellow, orange, red and purple can be spectacular. 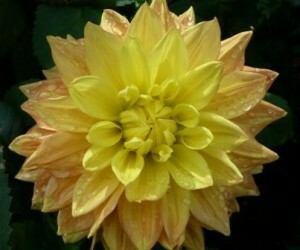 It is one of the main reasons for giving these plants garden-room. I am happy to admire these plants in other gardens, at least until I have a lot more space to fill. After this wet summer what has happened to Global Warming? 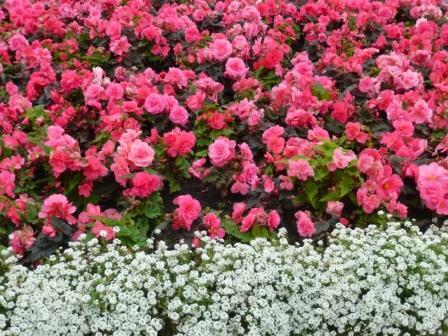 Are there any advantages of Global Warming and how should gardeners design for such changes. For many years I have seen floral clocks at Cartwright Hall, Bradford but just realised they are seldom floral. The plants used are low growing, coloured leaf plants like short Lavender, Sedums, Golden Moss, Blue Festuca grass and Sage. 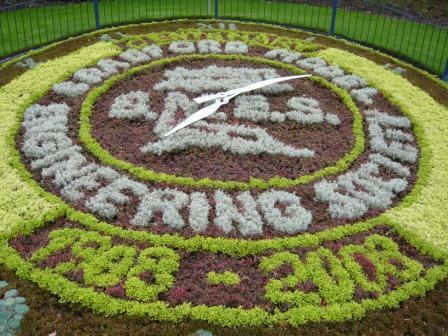 Each year the clock celebrates an event, charity or organisation – perhaps I will have a theme for my garden next year. 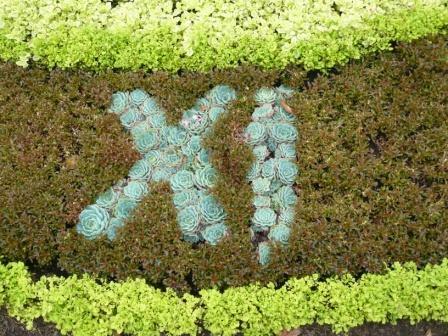 This year the numerals were picked out with Echeveria see earlier post. Debt clocks are the current fashion, they have little to do with gardening because I hope most gardeners tend to steer clear of debt problems. 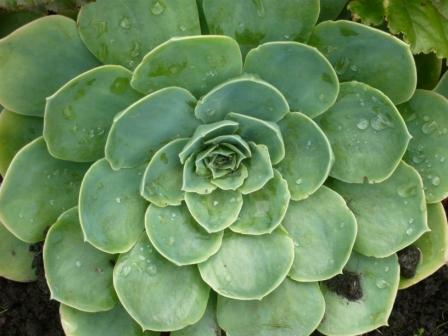 Succulents often have neat attractive leaf forms. The range of rosettes available in the Echevaria group include red tipped points to the leaves and tight groups of offsets as they multiply. This leads to a common name of ‘Hens and Chickens’. This specimen was part of a row at the front of a formal border. They can be grown with success in old sinks or pots, both indoors and outdoors. Ensure it is well drained and never stands in water. In rockeries or alpine gardens surrounded by gravel these plants can colonise neat areas and suppress weeds. As greenhouse or indoor pot plants they flower with interesting spikes. Again keep them quite dry. They make an interesting collection with enough variety to a maintain interest. Jerusalem artichokes are related to sunflowers not artichokes. So you will often see them flowering on the edges of allotments. 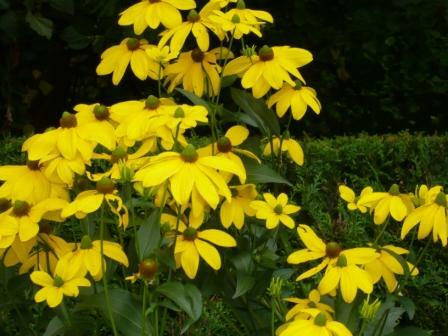 The stems are up to 10 feet tall and the yellow flowers in September are quite bold and eye catching. The fleshy rhizomes or tubers are eaten like potato. They are knobbly in shape. They have a nutty flavour and are best steamed or roast, with or without skins. The plants are perennial but good tubers are grown when the soil is rich and fresh so replanting is encouraged. 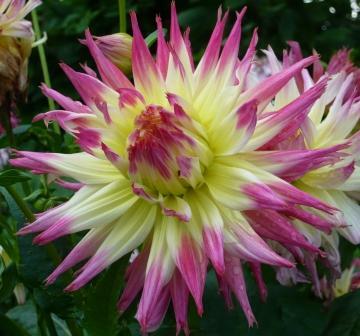 Decorative Dahlias provide colour through to the first frost. This dahlia was snapped in the rain at Harrogate Valley Gardens which has a great show of Dahlias in their own raised bed. That may account for the six foot specimens that were on display. I was taken with the two tone effect of this flower. Many of the other flowers at this time of year are the brash purples, striking pinks or strong yellows. Check now in parks and public place to see what colour schemes work. Then plan your own scheme for next year. If you click on the above link Doug will show you on a video how he makes a liquid compost. I use Comfrey leaves in my water barrel when I want an element of organic fertilizer from the compost. To fertilise blogs we rely on links to other sites. Below are some other gardening related blogs that I read from time to time. We are happy to be linked to other sites. 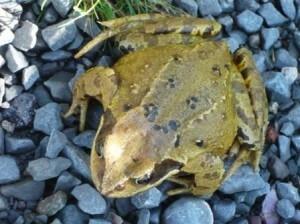 Jane Perrone’s organic allotment and garden blog from England. A bit different with photographs from the natural world in Yorkshire. Gardening and landscape design with attitude. Hardy plants for hardy souls from Kathy Purdy in New York state but could be UK. Bokashi, Japanese composting, is really a fermenting system. It converts your household food waste into a liquid and food remnants that are ripe for final composting. Ripe isn’t a fair word as it smells only of sweet pickle. An additive of a lactic acid based micro organisms in a bran carrier is mixed with the food waste in an airtight bin and a culture like a ginger beer plant is created. These microbes include lactobacillus bacteria, phototrophic bacteria and yeast. The fermenting process takes a couple of weeks then the residue can be added to a compost heap or buried even though it can still retain some food colour and shape for a further 4-6 weeks. The liquid can be diluted with water 1:100 as a fertiliser. Adding soil and worms to a normal compost heap achieves similar results. Whilst this may be a bid of a fad it encourages a ‘good green routine‘ and is worth a try. My Osteospermum was donated by cutting from a neighbour about 10 years ago. 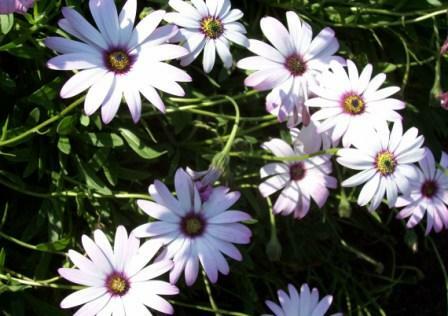 The large daisy shaped flowers appear all summer long in a light purple shade. It would be hard to count the number of flowers each year and I am guilty of not feeding the plant. 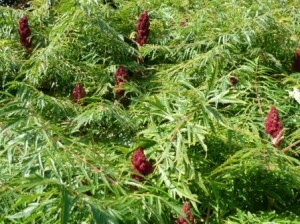 The plant seems hardy and is evergreen with greyish leaves. I have placed it in the sun to droop over a wall where the soil is well drained. Other common names include African Daisy or Blue-eyed Daisy so you could guess it is a member of the Compsitae family. The lax and blousy habit make them an attraction in seaside locations where they thrive. They can be pruned or trimmed back in September.